2019 marks the Year of Pig on the Chinese Lunar Calendar. To mark the Chinese New Year, the Ambassador of China to Fiji, Qian Bo, and Assistant Minister for Education, Joseph Nand officially launched the Chinese Year of Pig Stamps yesterday at the China Cultural Centre in Suva. The Year of Pig stamps were designed by Xu Lixian and Zhang Tao from Shenzhen, China. Chief Designer Xu Lixian was personally present at the launch ceremony to sign the purchased stamps for the audience. 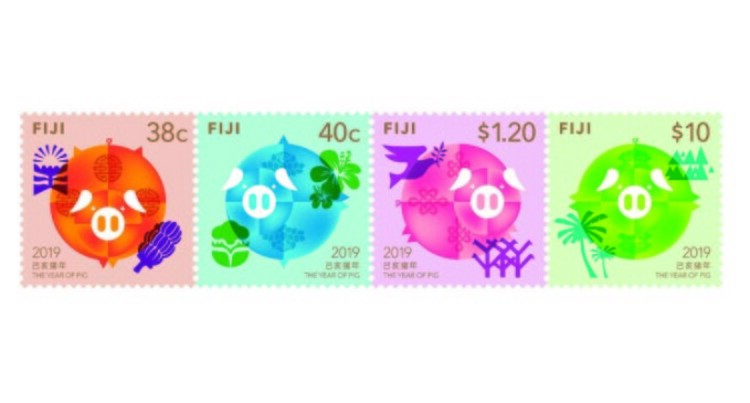 This is the fourth year in which China Cultural Centre in Fiji and Post Fiji Ltd, co-operated in designing and issuing of the Chinese New Year Stamps. The two organisations had co-operated in the design and issued the commemorative stamps for the Year of Monkey, the Year of Rooster, and the Year of Dog, previously. These stamps were warmly welcomed by the Chinese community, the local community, and stamp collectors from mainland China. The stamps are available at Post Fiji outlets. The design comes from the pigs among the Zodiac animals of Chinese traditional culture. The Chinese sprightly and contemporary artistic expression, fused with Fijian totems of humanities, natural environment and national symbols were used. These Fijian cultural elements indicate the colourful and splendid archipelago and the main features of Fiji. The different colours highlight the rich geographical resources of a tropical ocean country. The design is an integration of traditional culture and contemporary aesthetics. Chinese cultural characteristics, fused with Fijian humanistic features have demonstrated the uniqueness of Chinese and Fijian cultures, symbolising the friendship between the two countries and their promising future. Pig is the last zodiac sign amongst the 12 Zodiac Animal Signs of the Chinese Lunar Calendar. The Zodiac Sign “Pig” represents the characters of diligence, simplicity, courage and honesty. Those born in the Year of Pig are not very thoughtful but are always very lucky. People born in 1935, 1947, 1959, 1971, 1983, 1995, 2007 and 2019 have the birth sign of a Pig. The Chinese New Year is the most important festival in China. This is also called the “Spring Festival”, as the New Year’s Day always falls around the beginning of spring; the first term among the 24 solar terms. Celebrations begin from the New Year’s Eve to the Lantern Festival, the 15th day of the first month on the Lunar Calendar, which is also a day with the full moon. Chinese New Year is the festival for family reunion. Around Spring Festival, people from different places go to their parents’ home, reuniting with family members. During the Chinese New Year celebration period, people have abundant meals together, visit their relatives and friends with gifts, and enjoy staying with their dear ones. Many people resume work after a week from the New Year’s Day, but not everyone goes back to work until after celebrating the Lantern Festival.